PATROL BASE GHARDAI, Afghanistan – In two embedded assignments in Helmand province this year, I’ve heard a lot from Marines about how much the Afghan National Security Forces have improved. Frequently, that holds true. Generally, they seem far more willing to patrol and stand up to the Taliban now than they did in 2010, when I saw regular tensions between Marines and soldiers with the Afghan National Army in Marjah, a district that was rife with violence at the time. Sometimes, you see the flip side, though. And today was one of those days. A team with Marine Border Adviser Team 1 made the trip today through Khanashin district to this patrol base, a position manned exclusively by an element of the Afghan Border Police. Unlike other elements of the ABP that we’ve seen this week, however, this group has leadership issues. Earlier this year, the lieutenant in charge of 1st Tolay, 1st Kandak, 6th Zone -– the element of ABP we visited today -– died in an improvised explosive device explosion. Haji Samad was well respected by his troops, and demanded accountability from them, Marines said. Samad was replaced by another officer, Lt. Merza Khan. His troops quickly found him to be selfish, and the lieutenant eventually left his troops here in Khanashin district for an extended stay in Lashkar Gah, Helmand’s capital. 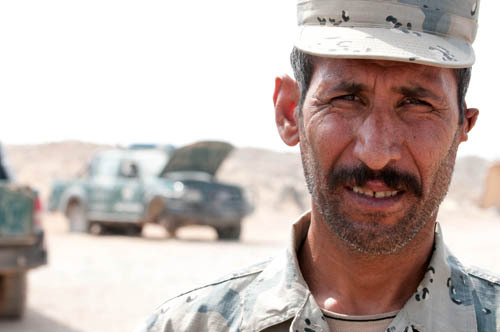 In Merza Khan’s absence, the ABP named a sergeant in the unit, Yar Mohammad, as the interim tolay commander. His troops rallied around him -– until Merza Khan unexpectedly returned. Mohammad, a nephew of the fallen Samad, led a mutiny in which about 20 members of the ABP left their post and went to protest in Lashkar Gah, said Marine 1st Lt. Tim Pease, a BAT-1 adviser. Yar Mohammad and about a dozen of the ABP personnel who sided with him are currently out of the fight, and hoping for another assignment. We visited the post they left today -– and found it in disappointing shape. PB Ghardai was covered in garbage ranging from apple cores to food wrappers, potentially sabotaging sanitation on the base. Several ABP trucks on site also were in disrepair, raising questions about how much the tolay can actually do. The Marines, clearly disillusioned by what they saw, questioned how conditions at the base could have spiraled so badly in the two weeks since they last visited. The Marines pressed the ABP to enforce better standards, and to request tires needed for their trucks from higher headquarters. Despite several trucks having flats, they hadn’t done so. The ABP have started to fill in some of the vacancies in the tolay, and many of the troops who remain were complimentary of Merza Khan today. Still, it’s clear a power struggle like this never would result in a mutiny of this sort in a modern security force. In Afghanistan, it’s just one more challenge the people face.